Jay Perrine will be our speaker this month. He recently took a class from Sarah Robinson PhD. at the Marc Adams School. Sarah has a wood turners background and a wood science PhD. 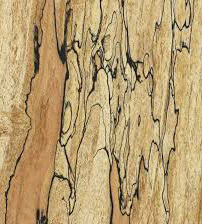 Jay will talk about the ideal conditions for fungus to create spalting; isolating the Fungi that creates color in advanced stages of spalting; and how to stop spalting. He will describe isolating the dye from the fungus, creating a colorfast dye, and using the dye to color a turned piece. 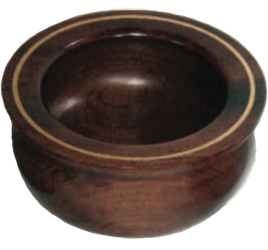 "Silicon Valley Woodturners are having our 20th year anniversary celebration. We would like to invite our closest fellow club members to join us in our regular Wed meeting, and to celebrate with us at the October meeting (Wed, Oct 4, 2017). "After the normal meeting announcements and presentations of the show-and-tell, we will have a cake/ice cream celebration in the main woodshop for everyone there to celebrate 20 years of teaching and practicing woodturning. Some past members may be there, and perhaps some memorabilia from the club's past. "We ask that club members consider bringing some past turned special piece that had been a club president's challenge for a encore viewing." This piece is submitted by Bob Bley. "The wood spins, creating a blur which becomes the canvas on which I paint. I It has no beginning or end, only limitless possibility. No artist brushes here; only knives of steel to create the image inside waiting to be freed. Mystical in nature, I peel back the layers of time that have been implanted by all that this tree has known, and by all who basked in its greatness. As its secrets are revealed to me with each passing revolution, I have to wonder what lies within it next that will shape its final destiny. This amazing creation by God has helped mankind since time began and it matters not whether it is dead or alive. Its usefulness is unfailing as it transforms from one phase of its existence to another. "How unselfish this gift of nature is! With little reflection one can marvel at and appreciate this manifestation. One can hardly list all that a tree has done for thee. Now in my hands, it makes its final journey as my tool's path is guided by its inherent beauty manifesting itself with each passing revolution. The final outcome will have no beginning or end. It will be so much more than when I started, as a new purpose for its existence is created. The human element embraces and gives deeper meaning to the tradition of a wooden vessel. "The Bread of Life" is not complete unless served up in family heirlooms cherished for generations. It is an awesome responsibility to be part of the cycle of life for one of nature's greatest gifts to mankind. I am a woodturner."